Microsoft has announced that the next version of Windows will run on ARM-based devices. 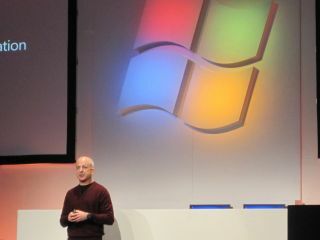 Microsoft's head of Windows, Steven Sinofsky oversaw the demo and also provided insights into what he was at pains to call "the next version of Windows" rather than Windows 8. The new OS will offer complete support for System on a Chip (SoC) architectures. SoC essentially takes the discrete components of a PC and combines them on single chips or packages with the benefit of increased effeciencies, such as power consumption. "More stuff in less space," surmised Sinofsky. "You don't think about the phone in your pocket being able to run Windows, but that's basically what's happened. We think of PC based devices being X86-based and mobile devices being ARM-based." "Some people think we'll all get slates, but customers are asking for more things, such as being able to plug in a camera or an SD card." "This desire makes it a natural fit for Windows. If you want a bigger screen, or more ports, or a convertible, Windows is a great way to think about how we can provide that to consumers." At today's announcement, we saw demonstrated the next version of Windows running on new SoC platforms from Nvidia (Tegra 2), Qualcomm (Snapdragon) and Texas Instruments on ARM architecture. We were shown various scenarios including hardware-accelerated graphics and media playback, hardware-accelerated web browsing with the latest Microsoft Internet Explorer, USB device support and also printing to an Epson printer with an adapted driver. Taking about adapting software for the platform, Sinofsky demonstrated Word and PowerPoint, though there is work to be done here. "For today we wanted to make sure we said that we're doing the work in Windows to enable it to run on ARM. As for [other applications] we'll say more about that as we move towards release." Before the demo Sinofsky said that what we would see was a demo and nothing more - "we won't be showing any new user interface, we won't be talking about packaging or anything like that. So while we saw new native ARM code running, we saw a UI that was very much Windows 7. We were also shown the latest x86 kit that will also be shown off in the keynote laterincluding new PCs from HP based on Intel's new Sandy Bridge architecture as well as the new AMD Fusion chips. There was also a demo of a Samsung convertible tablet and netbook as well as an Asus tablet PC designed for the home with a wireless keyboard and stylus. We also got a preview of the second generation of Microsoft Surface, powered by Windows 7 and a multi-core AMD processor alongside a gorilla glass screen. The new unit features even more responsive pixel sense technology as well as hardware-based decoding. The new Surface is four inches thick and has been developed in cahoots with Samsung. As to when this version of Windows would appear, Sinofsky was classically cagey. "Maybe I'll use this as a chance to talk about our mindset on releases. There's a huge responsibility to do things properly. Releases – we try to have a balance. We try to aim for 24-36 months between Windows releases and that's not really that long. We're very, very early."